Life is all about perspective, depending on one’s perspective, a white empty space can be intimidating and challenging, or it can be a blank canvas waiting to be turned into a masterpiece. 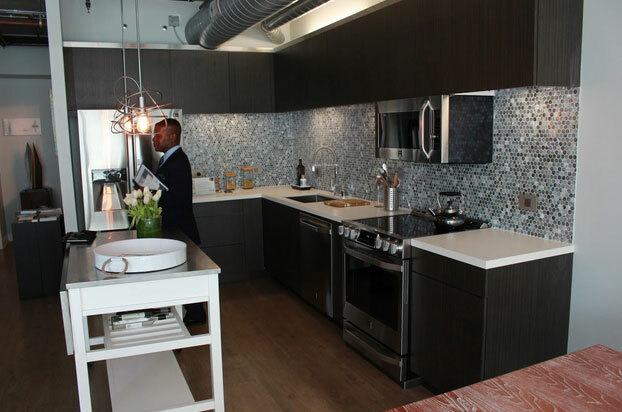 MetLofts is a white space of opportunities in the downtown Los Angeles community. 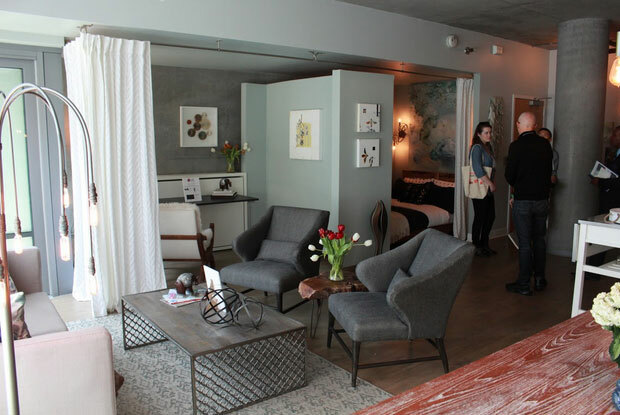 During the Dwell on Design, Los Angeles show, Loft #218 was showcased during tours conducted by Dwell Media in Partnership with other sponsors. We’d like to invite you to take a further look at the magical transformation. Designer Lauri Howell was responsible for turning this wide open space into a spectacular feature of modern living. 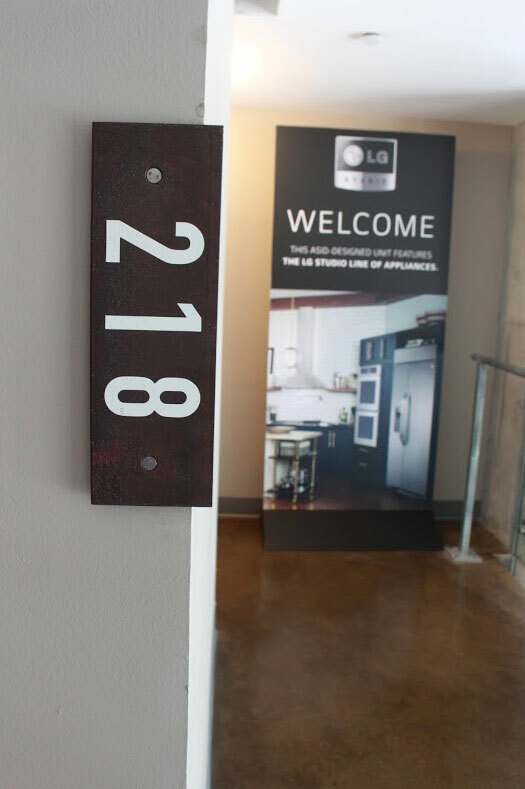 It would highlight the potential of the new spaces in the community as well as some must have furniture provided by the local modern showroom LA Furniture and, of course, top of the line gadgets for the modern loft-dweller provided by LG. 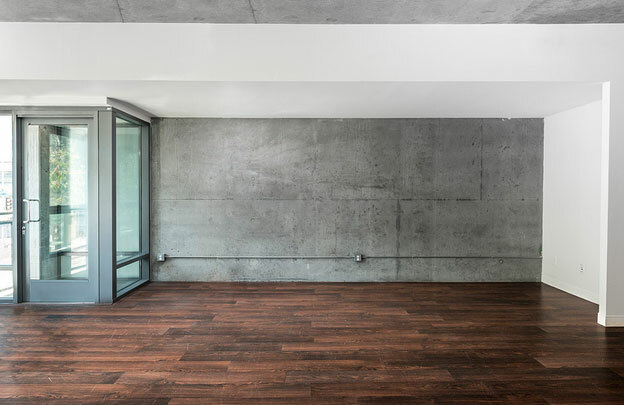 The loft started off very basic and simple.Stark and empty, the loft called for a major boost in style and pizzaz. While, structurally attractive, and loyal to its architectural style, it was in dire need of a personality transplant, that would highlight its true potential. Lauri found herself with a challenge. All of the zones of the space needed to be defined, yet unified by the lack of interior walls to divide each section. 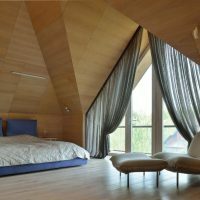 Creating a symmetrical balance was crucial to maintaining the flow of the loft and the circulation patterns within it. The zones would command a trained artistic eye to orchestrate completion. The first zone to work on was the kitchen. The concept of a clean white slate was no joke. The original kitchen was completely white. Both cabinets and appliances were all a wash of white. 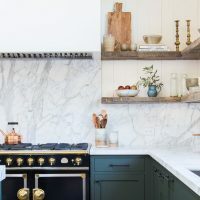 The exposed air ducts paired with the direct contrast of the dark speckled countertops and the white cabinets made the kitchen feel cold and sterile. 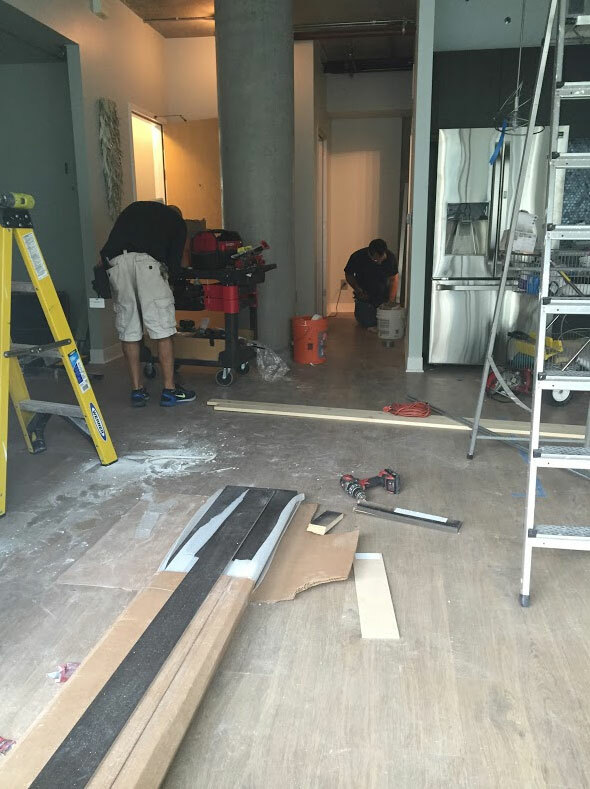 With the help of a trained construction crew, the first step would be to rehaul the kitchen. They would assist to turn it into a swanky hub for gourmet creations, befitting the lifestyle of its future inhabitant. 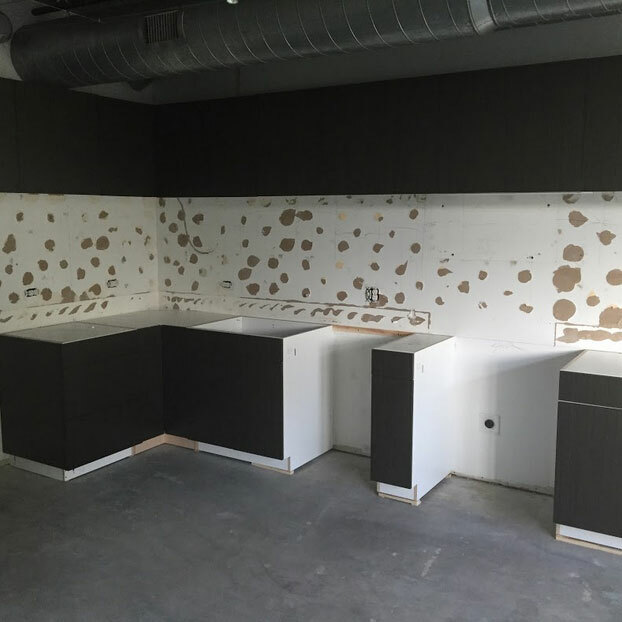 With the dark and white pieces in place, the kitchen was ready for some color. 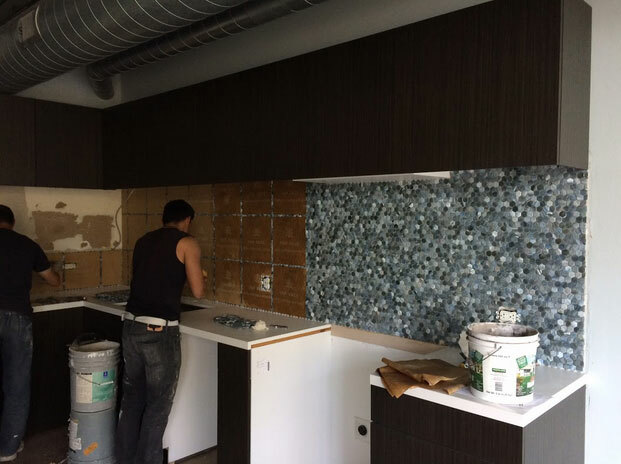 Construction crew would carefully and meticulously place multi-colored hexagonal Mosaic tiling on the wall in a truly remarkable dance in shades of blue, grey, and white. 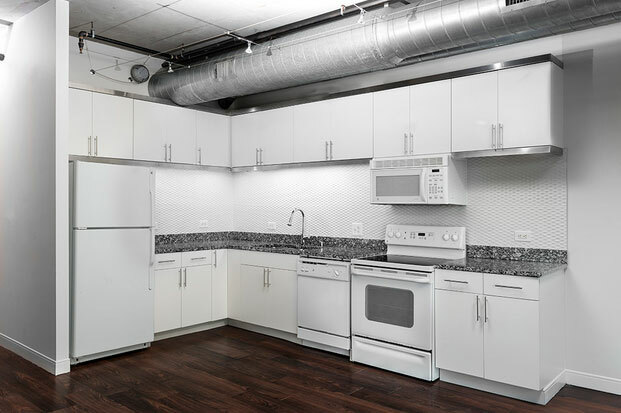 With the finishing touches, in the form of stainless steel LG appliances and a small, yet functional, Island table, Lauri brought the kitchen into the 21st century.Take a look at how drastic of a change their efforts made when construction was finished. To stay true to the lofts architectural integrity Lauri would have to get creative to make each zone complete and finished without being separated from the next with walls. The inviting modern calm naturally flows into the rest of the space. The accent wall in the dining area, airy like the kitchen, in a shade pulled from the multi-colored tiles, reinforces the soothing feeling of being home. 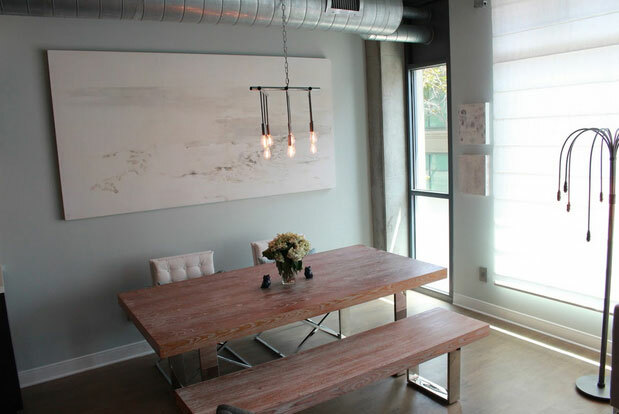 The completed dining area is cool and collected like a dreamy summer day getaway. The lighting is like hanging droplets of water from the fixtures above the table and the weeping willow tree floor lamp nearby. 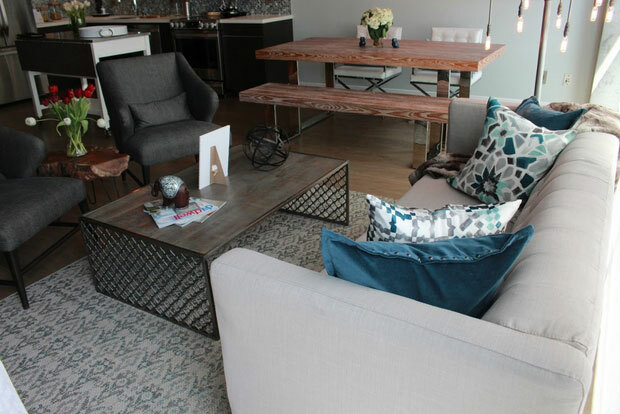 The dining seating is picnic style complete with a long dining table and matching bench in a brushed Elm finish with sleek, polished chrome legs along with two director style chairs in a white eco-leather to add softness and versatility. The beachy color palette extends into the living room which lends the space a cohesive, “California cool” style. Harmonious with the style, is LA Furniture’s Dominic 3 seater sofa, upholstered in a light grey fabric, accented with colorful, patterned throw pillows. Last would be the bedroom and office zones. 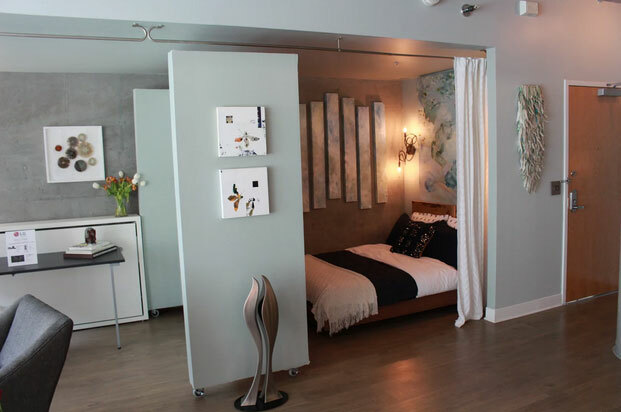 To separate these spaces, Lauri incorporated draperies and a free-standing movable wall for additional privacy. Both elements add function and sophistication to the space. Once again the construction team worked hard to do its magic. With their help the mess of wood and plaster morphed from the above picture to the one following. 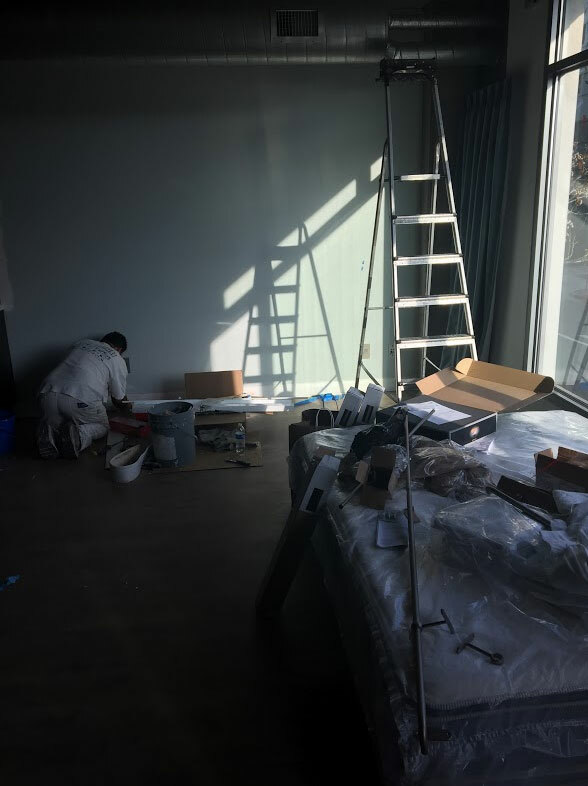 As you will notice from the shot below there is now a section of wall for art in the office and bedroom zones. 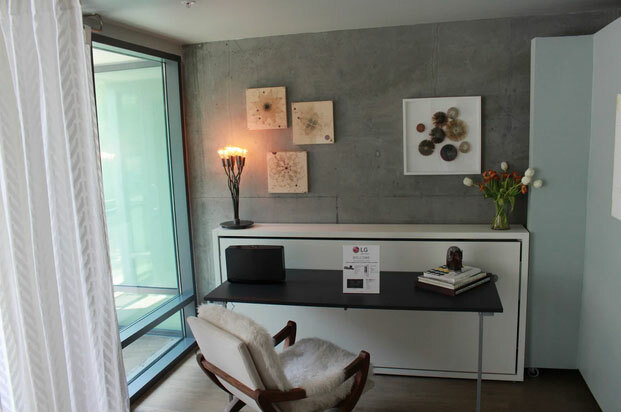 The wall has portability with wheels fixed to the bottom that allow it to be moved from the bedroom to the office to the living room for cinematic viewing, of the attached 55” LG flat screen TV in any zone of the dwellers choosing. Reconfiguring the space is therefore that much easier if at any point the dweller would like to change where any specific zone is located. The results of these innovative divider elements truly make this transformation transcend to new heights. As you can see, it was a truly remarkable change that is sure to awe and inspire all who enter the space. 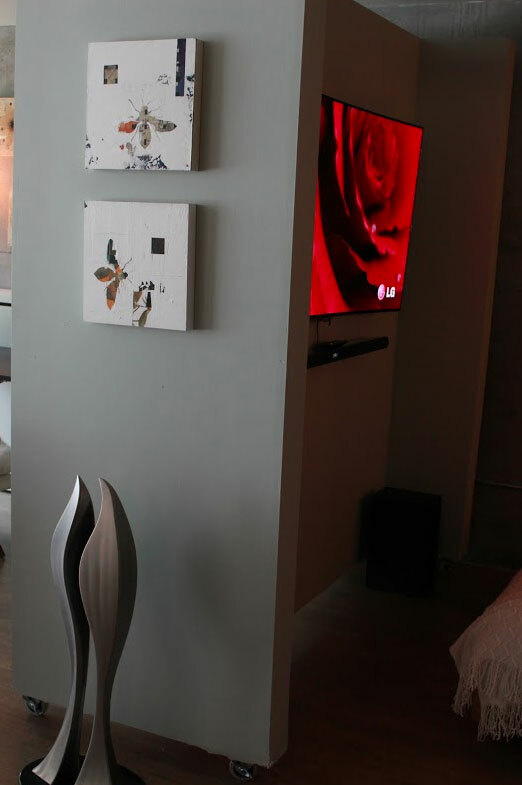 No loft living space would be without its share of electronic screens to dazzle. Thanks to LG, the space had its spot in the limelight too. As stated a little bit above, LG provided a 55’ inch screen for the space which is currently on the movable wall facing the bedroom space. 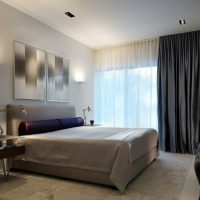 On the corresponding office space, the white box square tucked away behind the desk is actually a sofa with the capabilities to turn into a bed as well where tv viewing can be made even more comfortable there too. The sofa box is a beautiful but sneakingly deceptive way to bump up the abilities of the living space for those times where there’s one extra unplanned guest. 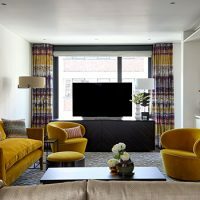 As Lauri Howell has proven, choosing the correct key pieces for any space can take it from drab and dull to stylish and swanky. If you were impressed with this space, just think of the possibilities you could do with yours.